What a wonderful surprise this is from Starbucks. When the first batch of Kona Private Reserve sold out so quickly, I wondered if we would ever see it again. Kona is a tiny coffee growing region when compared to others. Starbucks has released the new 100% Parry Estate Coffee this month. The review featured below is for last year’s Kona Private Reserve, but the flavor profile is very similar: caramel and floral aroma with a citrusy aftertaste. Most high quality kona coffees have a very similar flavor profile. The new private reserve is from Parry Estates, which at 2,000 feet elevation, is one of the highest coffee farms in the kona coffee belt (kona has a unique ecosystem that allows coffee to grown thousands of feet lower than other coffee regions). We will update the review soon once we receive our order for the coffee. However, be warned: the last private reserve kona sold out after three weeks. It might be all sold out by then! Starbucks has created a private reserve collection of limited edition coffees that are meant to give coffee tasters an opportunity to sample some of the more boutique coffee regions where the coffee is either in too limited in supply–or too expensive–for Starbucks to put into all of its thousands of stores. 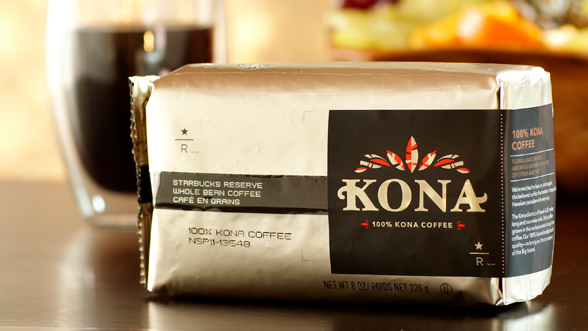 Starbucks is now finally able to brew gourmet Kona Coffee. The addition of the Clover machine to Starbucks’ armory means that it now has the opportunity to roast coffees that have more subtle flavors and aromas that would usually have trouble being expressed with their current brewing methods. An earthy Sumatran or a citrusy Kenyan will always taste like what they are, but with Kona coffee’s smooth and nutty notes, it needs a more refined brewing method. 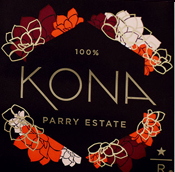 Enter Starbucks Reserve 100% Kona Coffee. Ever since I became a fan of Kona Coffee way back in 2008 (a lifetime ago!) I’ve been waiting for Starbucks to give Kona Coffee it’s due treatment. I ordered it from a Starbucks cafe here in downtown Vancouver, and boy, oh boy: I’ve never been so uplifted and soothed by a cup of coffee like this. When you sip this coffee, the first thing you notice is the sweet, caramelly taste. Kona Coffee is always smooth, which essentially clears the way for you to really experience the caramel. Then it gives way to a nutty aftertaste with citrusy notes. I noticed that my shoulders dropped and instantly felt more relaxed. It’s not quite a day at a rejuvenating spa, but the zen experience while sipping this cup was quite welcome. Usually I’m not a fan of Starbucks’ darker roasts: French Roast is too smokey and charred for my taste, Yukon is like a punch in the face (some people like that in their coffee). I’ve heard people suggest that darker roasts are used to cover up imperfections in the coffee beans, so that all roasts, no matter the season, will taste the same. But with the Kona Coffee, Starbucks has really shown people how good a dark roast can be. They use Kona’s Extra-Fancy beans, which as I’ve stated before, are the top of the line coffee beans in an already gourmet coffee region. Extra fancy beans are the largest, have the highest moisture content and the least amount of imperfections. The Extra-Fancy roasts for Kona Coffeee tend to go for about $35 for a half-pound usually. Starbucks is selling theirs for $28, which is the most expensive coffee beans Starbucks has ever sold. However, it’s actually the cheapest Extra-fancy coffee beans you’ll find. Bravo to Starbucks for making a truly gourmet coffee out of the best coffee beans that the Kona region has to offer. I instantly bought two packages, after sampling it. I advise that you do the same, since it’s been selling out all over the place. Next Keurig vs Tassimo: Which Coffee Machine is Best?